The classic 1955 black comedy film, The Ladykillers, was adapted for the stage by Graham Linehan (co-creator of Father Ted) in 2011. It may or may not be the greatest of the Ealing comedies, but it is certainly the one that immediately suggests itself as theatrical. The story remains the same – a group of crooks pose as musicians while planning to rob a security van. Their plotting takes place under the nose of their kindly, if eccentric, landlady Mrs Wilberforce. Her trusting nature seems initially to be a help, but her strong moral compass eventually proves something of a hindrance! Linehan tweaks the original screenplay rather than revamping it. It is a clever modernisation that notably ups the swear quotient, and by recasting it as a period piece brings some of the darker themes into sharper focus while retaining the comedy of the original. Anyone playing the gang’s leader, Professor Marcus, is always going to have a hard job banishing Alec Guinness from the audience’s thoughts, but Alistair Burn does a fine job, combining an oily gentlemanliness with hints of depravity. He is more than matched by Kate Nichols as Mrs Wilberforce, foiling several of his ideas with her innocence and openness. The rest of the cast are also most impressive. Lawrence Chandler as the punch drunk boxer One-Round manages to give the stereotypical character a genuinely sympathetic side. 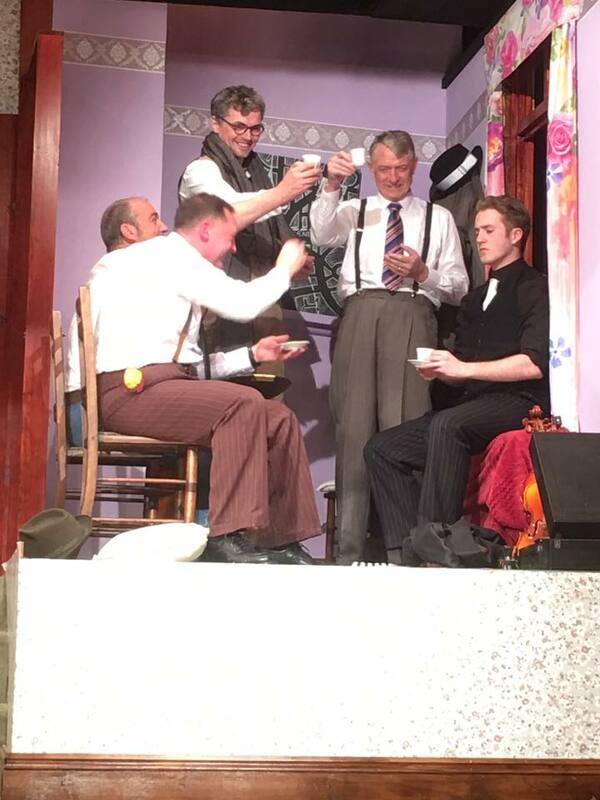 Glyn Casswell’s cleaning-obsessed spiv Harry Robinson is equally convincing, while Allan Jones as the ageing con man, Major Courtney, evokes pleasing memories of countless similar characters from British comedy. Aiden West as Louis, shows how far he has come in his acting career with a faultless performance as the ‘comedy evil foreigner’ character. 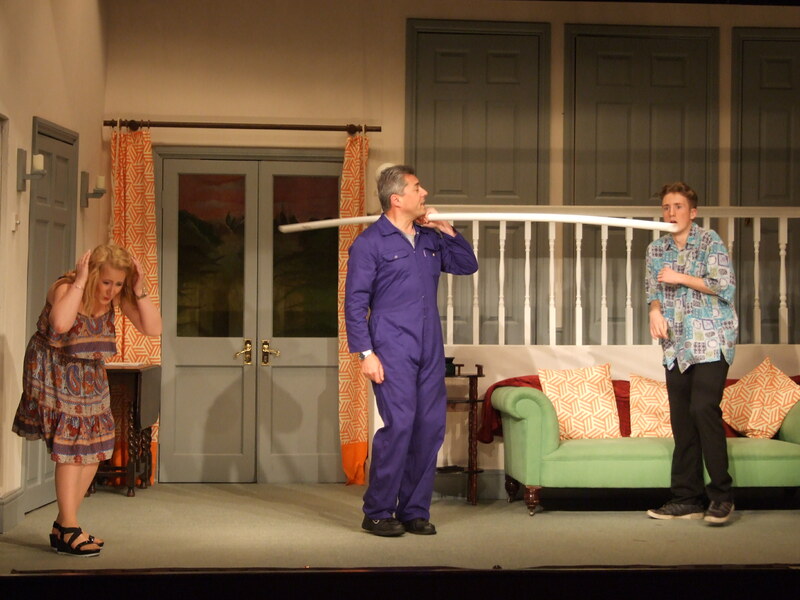 Sadly this was Aidan’s last production for Gainford Drama Club for the foreseeable future as he is now off to take up acting as a career and has a place at the Birmingham School of Acting at the Royal Conservatoire. He will be sadly missed. Michelle Hope’s cameo as the put-upon Constable MacDonald adds a layer of welcome sanity, while Ronnie Lowery supplies a haughty grandeur to Mrs Tromleyton, leader of a large and oddly assorted ‘Society of Women’. The pace of the show is exemplary, with the first act dialogue building to some beautifully timed and hilarious moments in the second half. Overall, there is a clever balance between characterisation, darker moments and humour that makes this a very accomplished production. 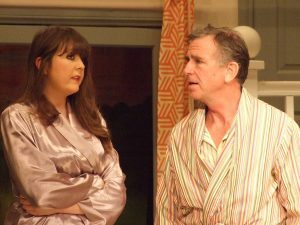 Not Now Darling is a traditional farce with all the regular hallmarks – people hiding in cupboards, spouses coming and going continuously and a wealth of mistaken identities and innuendo. Firmly based in the 1960s, the script by Ray Clooney and John Chapman reminds one of the “Are You Being Served” comedy of the 1970, to which John Chapman was also a contributor. The extremely funny and very snappy script, gave an excellent cast every opportunity to shine, which they seized with both hands. The small set was well presented and provided an effective space for the performers. The lighting and sound effects were subtly and effectively managed, with props and costumes clearly establishing the era. A constant stream of clothes flowing through the window, a clever plot and, most of all, superb pace maintained throughout there was never a dull moment. The two main characters, Arnold Crouch and Gilbert Bodley, were played faultlessly and most effectively by Aidan West and Keith Irons. Displaying a strong chemistry as colleagues they both handled complex and often rapid dialogue with immense skill and conveyed the contrastingly cautious and rash characters of the two men very plausibly. Aidan in particular displaying immense energy and animation. Emma Simpson as Janie McMichael and Lissy Rawlings as Sue Lawson played the femmes fatales from opposite ends of the social scale, quite beautifully, coping especially well with the varying states of undress involved. Michelle Hope as the long-suffering secretary, Miss Tipdale, was a catalyst to much of the action, her timing and reaction noticeably good. 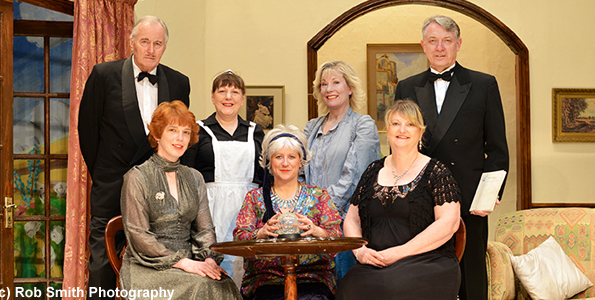 Cameo performances were portrayed by the remaining cast, Imogen Richardson, Jan Richardson-Wilde, John Robinson, Paul Richardson, Maria Lowcock and Glyn Casswell, all complementing the overall production and creating a marvellous and genuinely humorous production. Ten strangers are summoned for a long weekend to the remote Soldier Island off the coast of Devon, under variously different pretexts. Characters arrive individually and in pairs, having travelled to the island to see Mr and Mrs Owens; the hosts of this group holiday excursion. They are assisted Fred Narracott(Chris Allcock) the boatman, who appears briefly in the first act, complete with wellies and Cornish accent. Only the maid Mrs Rogers (Catherine Wilkinson), and daughter and cook Ethel (Melissa Rawlings), are there to greet them. They too are waiting on the missing couple. There is no way for any of them to leave the island, so they set about trying to determine who their mysterious hidden host might be and where he might be hiding. As stories are shared one becomes aware that no character has ever met the Owens’ and the confusion as to why they are there and who they all are, begins. While they are waiting, a recording, via a gramophone record, levels serious accusations at each of them that they have all been responsible for someone’s death. One by one, they are accused. One by one, their various sordid pasts catch up with them, as one by one, they meet their end!! Tom Brown as Captain Philip Lombard, is a confident man who admits to his previous crime and has come to the island equipped to deal with trouble. Lombard is accompanied to the island by Vera Claythorne (Paris Lowcock) and there is more than a hint of attraction between them. Anne Marston is a totally immature, irresponsible woman played wonderfully by Emma Simpson. General Mackenzie (Lawrence Chandler) is a retired military man who lost his wife some years ago. A wise, if not slightly confused man, who in a lovely way gains your sympathy. Miss Emily Brent (Kate Nichols) is a delight to watch. Looking down on most of the guests, she is a woman knows what she wants and likes and usually gets it. Carl Howe, in his first role for the Drama Club plays, William Blore, who initially hides his identity as a former Policeman. Jo Longstaff plays Dr Edwina Armstrong (there is always a Doctor). And finally, we have Judge Wargrave, probably the biggest role in the whole production and a huge one to take on by Keith Irons in his debut for the Club. Keith had the appearance and characteristics of a Judge to perfection as he acted as a calming influence as the night continued. 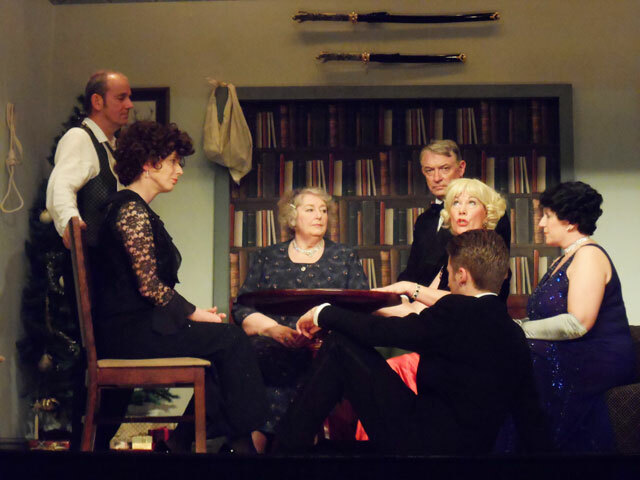 Based on Agatha Christie’s masterpiece, And Then There Were None is the mystery play at its finest. To this day it remains the world’s bestselling mystery novel. The tension rises as the characters begin to unravel. Fingers point and suspicions are raised at the slightest thing. Each actor plays their part wonderfully and moments of humour are capitalised on. This successful production of And Then There Were None was Maria Lowcock’s first attempt at directing for the Club. It is a taught thriller that keeps the audience enraptured as they try and work out who is the killer at the same time as the characters. This production shows why this story is a classic. Altogether an entertaining evening of suspense. Spring and Port Wine is a domestic drama, set in the late 1960s, which centres on the attempts of Rafe Crompton (Allan Jones) to hold his family together by being a strict disciplinarian. He wants to retain old-fashioned values while his children, noticing that outside the world is changing rapidly, are intent on rebellion. Rafe is a domineering, Bible-quoting tyrant who must have the truth whatever the consequences familiar to older members of the audience must have seen glimpses of their own father or grandfather; Jo Longstaff is delightful as his wife Daisy who uses all the wiles at her disposal to try to keep the family together, including fiddling the weekly household accounts when anyone is desperate for money. Although written nearly 60 years ago, Spring and Port Wine still has resonance today. One of Rafe’s sons Harold (Alistair Burn) points out there won’t be another depression because there are “economic plans to make it impossible”. 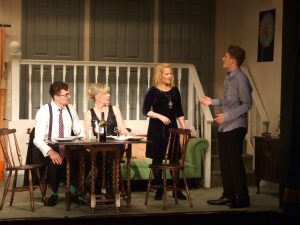 The first half slowly builds as the relationships between the six family members, a fiancé and neighbour, Betsy Jane (Michelle Hope) are fully explored and tee up what’s to come after the interval. Then the action really hots up as one by one Rafe’s children plot against him and decide to take their revenge on his authoritarian ways. 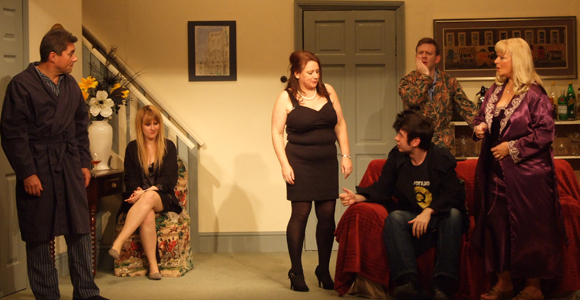 Melissa Rawlings, in her first acting role for the Club, gives a stirring performance as Hilda. She’s belligerent yet on the verge of a tantrum as she’s determined to walk out of the home on a point of principle. Others soon resolve to follow suit. 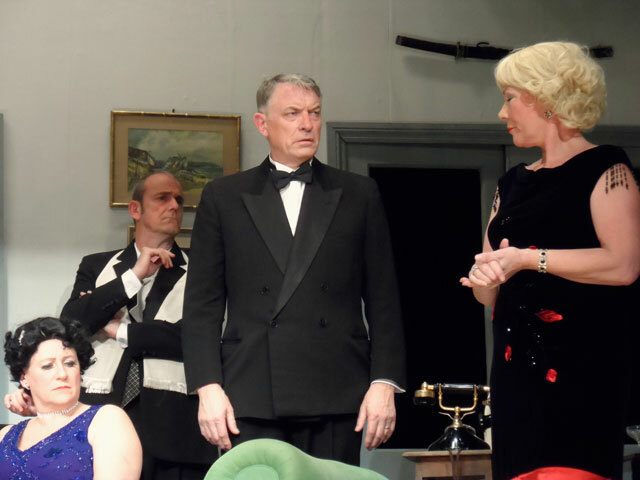 Even elder daughter Florence (Emma Simpson) and her defiant fiancé Arthur (Glyn Casswell – another debutant) turn against Rafe because of his obstinacy. The tension builds superbly as Rafe confronts youngest son Wilfred (Aiden West) and there’s silence in the auditorium as Daisy confesses to Rafe her inadequacies in the home while he reveals a childhood secret which led to his thriftiness. It’s a tender moment which achieves maximum pathos. Spring and Port Wine is well acted, on an interesting set with good direction direction by Ronnie Lowery. I hope you are all enjoying this summer weather it is long overdue. Looking back our spring production, which now seems long past, was a very successful “Will You Still Love Me In The Morning”. This was directed by Lawrence Chandler, and this play introduced Alistair Burn, treading the GDC boards for the first time, as well as two new members, Melissa Rawlings and Jo Leversuch, helping back stage. For a while we have talked about the possible effects of the Darlington road closure on ticket sales. It does seem to have had an effect, as the last two plays, both were on after the road was reopened, showed a significant improvement in seat occupancy, at 84 and 91 % respectively. One of the most significant recent changes at the club is that we have obtained new seats for the theatre. Due to the refurbishment at the Darlington Civic we had the opportunity to purchase 100 seats from them, which we duly took, and they are now installed. The old seats we removed had all been sponsored and we have saved the name plates, and had them framed to form part of the Club`s history. We are selling the old seats, so, if you know of anybody who might like to have any number of them, please let me know. We are just asking for a donation. To help defray the costs of the new seats and their installation, we are asking for sponsorship for the new seats. The cost will be £25 per seat and name plates will be attached. Please, if you wish to sponsor a seat, or two, please let me know by e mail at: johnlowery49@btinternet.com or on 01325 733138 . The Club has been disappointed in the lack of members attending social events over the last year. Our Social Secretary spends a lot of time in organising these events, so please come along and support your club. The autumn production will be “Spring and Port Wine”, by Bill Naughton, directed by my wife, Ronnie. The cast has been chosen, and again, we have a new member taking part. The dates of the play are from 23rd – 26th November, 30th Nov – 3rd December. We also have directors in place for the next two plays for 2017. Maria Lowcock for the spring production, and Allan Jones, who would like to try a small summer production. More about these plays later on. 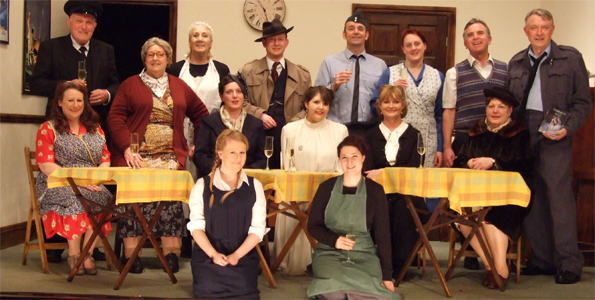 Gainford Drama Club’s spring production of the Brian Clemens and Dennis Spooner farce was certainly one to remember. From the first night to the final performance the company was almost word-perfect and handled the fast-paced, sometimes frenetic action with aplomb. The audience were chuckling from start to finish. The play was well-directed by Lawrence Chandler, assisted by Maria Lowcock. The plot is simple enough. Jeremy and Celia Winthrop return from their honeymoon a week early when their Spanish hotel isn’t up to scratch. Unfortunately Winthrop, looking for promotion, has handed over the keys of his cottage to his two bosses, and both decide to take him up on the offer. Even more unfortunately, both men are having affairs with the other one’s wife. Mayhem ensues as the Winthrops try to keep the couples apart. The actors built the pace superbly with immaculate timing and mounting puzzlement at the situation. Aiden West was outstanding as Jeremy, producing some amazing facial gymnastics as the horror of the situation began to dawn on him, but every member of the seven-strong cast made sparkling contributions. Emma Simpson was delightful as the deceptively innocent Sara Ward, Jo Longstaff convincing as the more sophisticated Thelma Jessel, and Paris Lowcock was excellent as Celia, Jeremy’s bewildered new bride. Paul Illingworth was hilarious as the more worldly-wise of the bosses, Humphrey Jessel, complete with urbane wit and sock-suspenders. Newcomer Alistair Burn gave a most promising performance as the more diffident Peregrine Ward. Paul Richardson played bumbling Syd Clancy, the comic odd-job man to perfection, quietly wrecking the cottage out of sight of the audience. The country cottage set with a plethora of functioning doors was a triumph of construction (obviously Syd Clancy was not involved) and held up to the exits and entrances superbly. Characters popped in and out of them with clever timing that added to the humour. 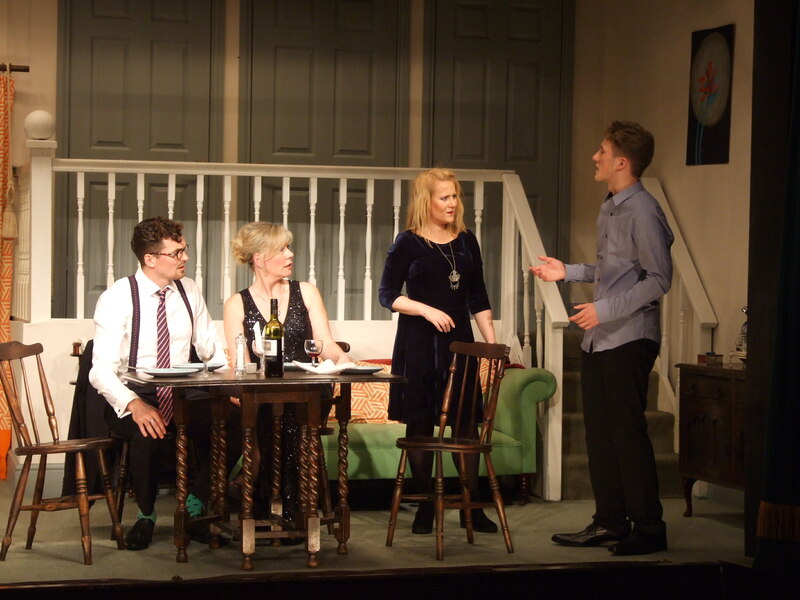 The props department had their hands full with dishing up the dinner party in two locations whilst the costume changes added to the confusion and comedy. All in all this was a great evening’s entertainment. 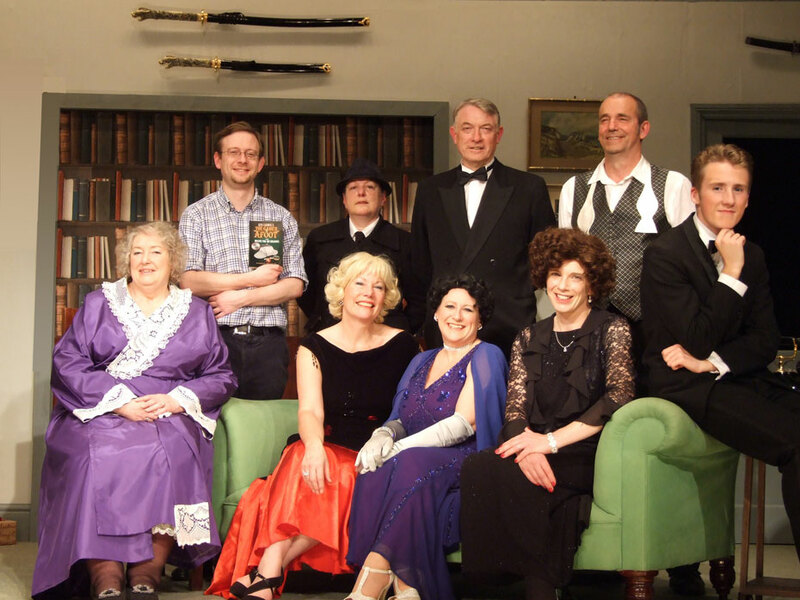 Gainford Drama Club welcomes new members – contact the Secretary, Mrs Ronnie Lowery on 01325 733138 or find us on Facebook. Gainford Drama Club’s production of Ken Ludwig’s “The Game’s Afoot” (or Holmes For The Holidays) is part mystery, part melodrama, part comedy, part farce as well as good, well-crafted entertainment. You certainly need a scorecard to keep track of who is dead, could be dead or someone wants dead. Is it Colonel Mustard in the drawing room with a knife? Maybe! The play testifies to the enduring popularity of the world’s first consulting detective, however, the story does not feature Sherlock Holmes himself, instead it portrays the actor William Gillette, whose productions did much to cement the Holmes character, which we know and love, in the minds of the public, introducing the pipe, cape and deerstalker. The production works as a comedy thriller; although the plot creaks a little and the humour only really gets going, with the some slapstick comedy and dramatic twists, in the second half. Then the antics had you laughing out loud. This final act is well-executed, with perfect comic timing such that the production is lifted into a confection of comedy. The actors are as invigorated as they are versatile and the cast is so colourful, that the characters could have been taken right out of a Sherlock Holmes mystery. The play has been transported to Teesdale for this production and the references made to t he area were well received. Both sound and lighting were effective during key moments and the quality was good. Someone appears to be trying to kill William Gillette, who has come to identify with his most famous character. Naturally, there are other murders, with the action taking place at his country house, transported to Teesdale, during a storm. William Gillette (Allan Jones), the central figure in the production, is portrayed as the confident star of the stage who has played Sherlock Holmes so many times he believes in a way that he is the detective. Michelle Hope, as Fel ix Geisel’s wife Madge, is sharp and funny, particularly strong when working in tandem with Felix. Maria Lowcock plays Aggie Wheeler, the quiet, somewhat perplexed starlet who is overwhelmed by the events in her life, while Aiden West who plays her new husband, Simon Bright, impressed with his performance in this his debut role for the Club. Martha Gillette, William’s mother, is played with great energy by Veronica Lowery, who portrays her as a mother with a comical overabundance of pride in her son’s accomplishments. 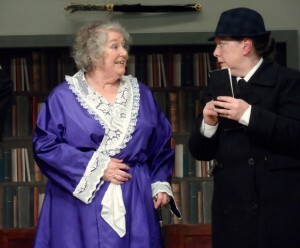 Inspector Goring (Iris Hillery) provides a foil for Martha’s knowing performance being constantly perplexed. Both get their fair share of laughs. Spouting Shakespeare to each other as actors are wont to do, the guests are soon accusing each other of blackmail, jealousy, adultery, and, especially, of murder. Luckily, an unusual , daffy, and occasionally savvy policewoman Inspector Goring (Iris Hillery) arrives in the snow storm to make sense of the pandemonium. Although set on Christmas Eve 1936, complete with a Christmas tree and presents, the h oliday doesn’t factor much in to the play at all except for a funny throwaway line by Michelle Hope, who plays Madge Geisel, Felix Geisel’s wife. After many secrets are out in the open, she casually asks, “So I guess we’re not exchanging presents tonight”. Tom Brown directs the comic chaos with murderers and victims hiding behind every corner and secret sliding wall panel. There are enough references to Holmes and to various stage whodunnits to keep fans of the genre satisfied, even if the play itself is short of tension. Added to the strong teamwork on display, this makes for a satisfying evening’s entertainment. 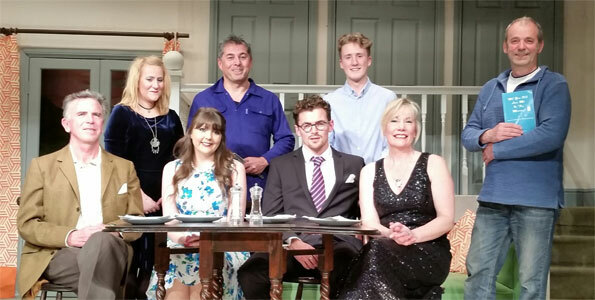 Blithe Spirit our spring production, directed by Alan Jones, was a great success and saw the introduction of several new members. On stage we had two new members making their debut for the club, Michelle Hope and Jo Longstaff, and backstage Aiden West and Rob Smith. They all proved to be great assets to the Club during the production. 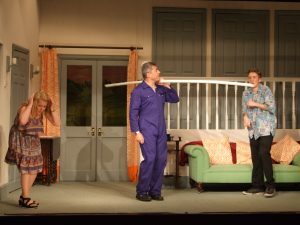 The Saturday matinee again proved to be very popular, overall we had 565 people who watched the play, and judging from the many comments, thoroughly enjoyed it. The autumn production will be directed by Tom Brown and play readings have already started to help Tom choose a play. The next play reading will be on Monday 11th May,7.30 pm, in the Green Room. Iris Hillery is planning a Talent Night as a club social event on Friday 9th October. We know we have many talented people in the Club so please don`t “hide your light under a bushel” come and “strut your stuff”. We are trying hard to publicise the Club and its activities via social media adding to our existing website. We have now added Facebook pages, one for members only and an open page to get our message out there, so please have a look at them and contribute them. “We are currently working towards setting up a festival in the area and wondered if this might be of interest? As well as our own two productions (COSI FAN TUTTE and the rock musical – ! – BEOWULF), which we would love people to join, the main idea is for any groups and other performers to put on shows under the umbrella of the Festival: drama groups/comedians/orchestras/dance schools… Perhaps groups have performed i n their local villages and could do a ‘swop’ with others; thereby getting extra enjoyment out of their hard work and doubling entertainment opportunities for their audiences. If anybody thinks this is a good idea for the Club to take part at this festival, please let me know. Gainford Big Weekend, in June, are having a scarecrow competition. It might be fun if we created a Drama Club scarecrow (could we put it outside the Theatre?). Would anyone be up for helping produce one? Please let we know.